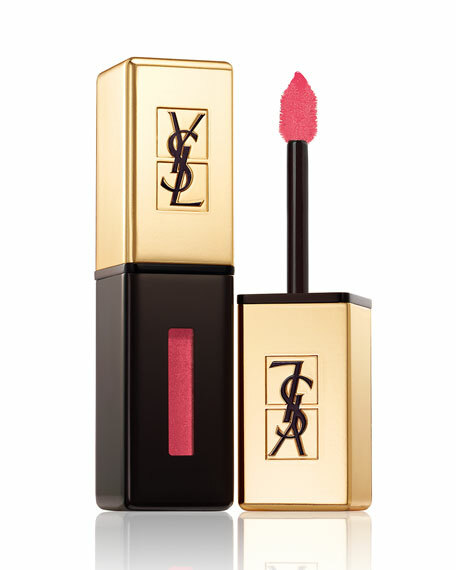 Glossy stain combines the texture and shine of a gloss with the long-wear of a stain for a truly innovative lip product. A lightweight texture that immediately melts onto lips. Glossy Stain delivers intense glossy colour for an extremely long lasting new kind of shine. The applicator's unique slanted tip and short soft bristles allow for flawless application with perfect precision. FOR NATURAL SHINE: Apply one coat on the center of the lips and brush towards the outer corners. FOR MORE COVERAGE AND SOPHISTICATION: Apply two coats using the outer curved side of the applicator, then dab on the formula generously over lips. We are offering engraving at no extra cost for this item, please choose up to 4 letters in the font shown. For in-store inquiries, use sku #1698900.